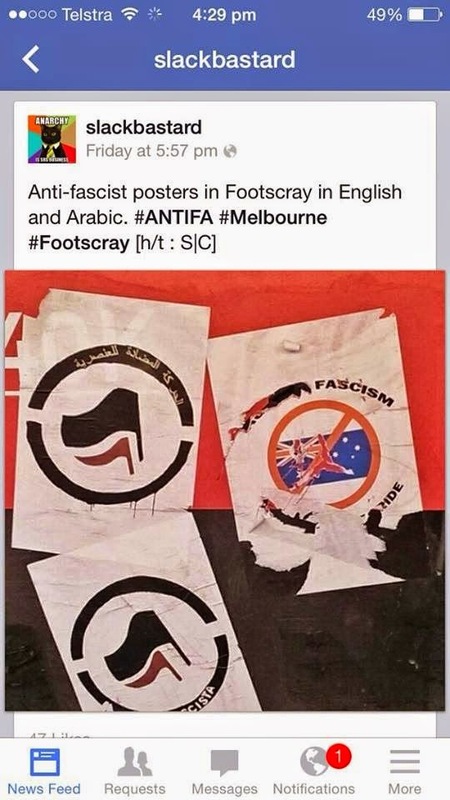 Whitelaw Towers: Antifa and The Australian Unions. Well it would appear that Australian Antifa are attempting to force Unions around this country to take up militant action against the working class. Now we have seen a lot of rubbish coming out of the Kosher Nationalist camp of late, but take this very seriously. Antifa and in particular Andy Fleming are agitating for direct militant action against Patriots of every type in Australia. We know they have nothing, we know when they say "militant" they can only mean one of two things. Islamic thugs or Union Thugs. At the Golden Dawn Rally last year Patriots and Nationalists were assaulted by members of the CFMEU. They were not only assaulted at the rally in front of various witnesses including the Media and the QPS, but also later at the Red Brick Hotel in Brisbane. The later assault resulting in charges and the up coming hearing mid this year. People had to be hospitalized by the cowardly attacks of that night. We know antifa are unable to carry out these types of attacks with out the support of either Islamic thugs or Union thugs. They know this also. Hence Andy Fleming and others are not only lying to get Union support, but openly pressuring them to carry out their illegal acts on their behalf. The following video is explanation enough. Face it we need Unions, in fact the majority of us have either been in a Union or belong to one. We are also aware that in most cases the Unions would be on our side, the working class. Yet there appears to be some elements in our Unions in particular the CFMEU who share the same agenda of Antifa. If you are in a Union talk to them, explain what is going on. Reclaim not only Australia for the Patriots but Reclaim the Unions for the Working Class. They might have to "force" others to get on board. From what ive heard around the place and from some tradie mates is that most of the CFMEU are Anti-Islamic. And Pro Reclaim Australia. They few lefties involved in Unions arent enough to stand a chance. Most of them would have to attack their mates and mates families if they were to take orders from Andy. If I'm wrong, bring it on. I will smash them back. No room for cowards now. The problem here is, if we had any brains we would be siding with Islam to take out the Jews, then once we have done that we turn on Islam. Reclaim support does nothing but strengthen the Zionist agenda. Then we havent got a leg to stand on. Who is we? I prefer to fight our own battles with out aligning myself with any evil, be it Islamic or Jewish. The problem I believe is both, the bigger problem is the refusal of our people to drop both and go it alone like we once did. I do agree with your thoughts on Reclaim. The "We" is the same as the "Our" you used (Whites in Australia and Throughout Europe). I agree we, our, us, I or you should go it alone, as we once did. Though things are not as they were. We are also dealing with Multiculturalism/Divide and Conquer/White Genocide etc etc. The most powerful influence on the world currently is the Jewish one. Uniting against it would overcome it, then the unity breaks, and Islam is then crushed.